Ever since Logan Browning teamed up with stylists Wayman + Micah, her style has elevated. Her stylist posted to their instagram page, Logan's latest look from her appearance at a Her Campus discussion. 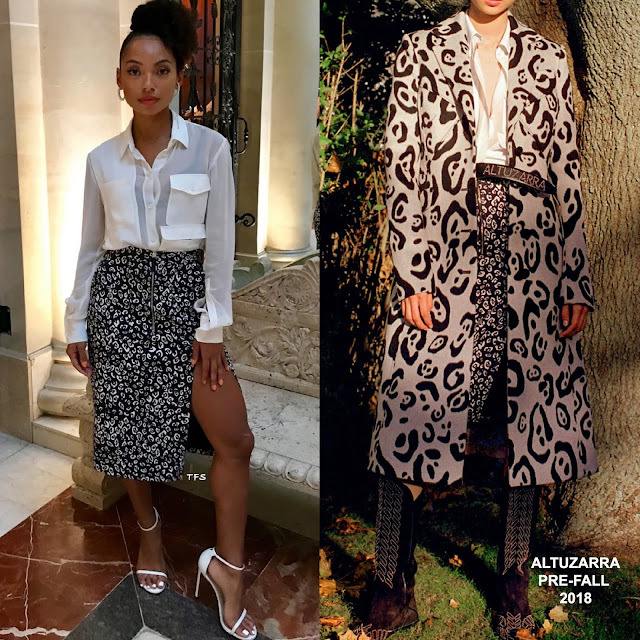 She posed for the gram rocking a ALTUZARRA PRE-FALL 2018 ensemble featuring a see-through white button down shirt and a black & white printed pencil skirt featuring a center front zipper & slit detail. From her flawless beauty look to the pairing of the STUART WEITZMAN 'Nudist' sandals in white, I love this look from head to toe. Her chic, flirty look was topped off with APM MONACO earrings. Are you feeling Logan's instagram style as well?